I think these divide the beauty nation. I've read some people saying how bad for your skin these are and I do partially think "yep, I see where they're coming from" but then the lazy side of me comes out (especially so after one or two drinks) and all I'm thinking about is the quickest way to get 'my face' off. I'm a strong believer in removing your make-up every night - my sister not so much. I read once that if you don't take it off it ages you by 10 years. This was probably a lie or a huge exaggeration but I'd rather not take that risk - you only get one skin etc. So it's the first thing I do in my skincare routine before I go to bed and before I put my make-up on in the morning. I'm going to contradict myself in what I'm about to say - but I'm really not brand loyal when it comes to which make up wipes I use. Sometimes it's because I've read something good about one brand, one packaging catches my eye whilst shopping or I'm simply sharing my friend's - it's nothing scientific so I guess I'm a captive audience - make up wipe brands take note! One thing I can't comprehend are the ones that are really dry - what is that achieving apart from feeling like I'm wiping my face with a tissue - girls you know what I mean! 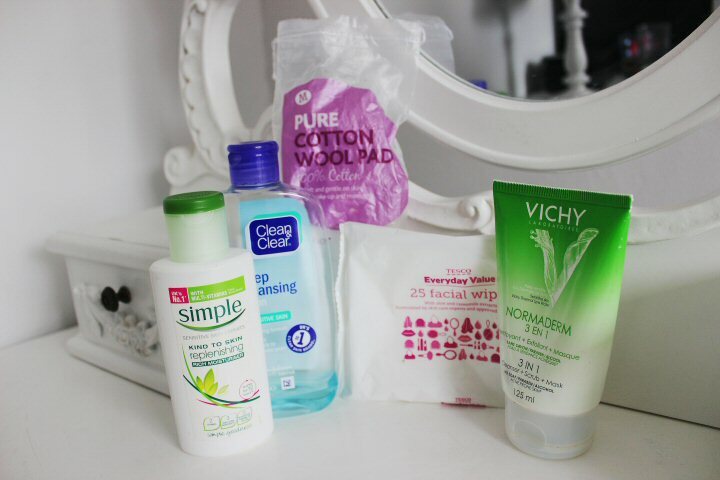 I also use my make-up wipes to remove any smudges or errors when applying my eyeliner or make-up in general. Double the use. So until someone convinces me how bad they are and what I can replace them with - they're with me for life. Simple are definitely a brand that I'm loyal to based on the ingredients of their products. I flit between two of their moisturisers - the 'Kind To Skin Replenishing Rich Moisturiser' and the 'Kind To Skin Hydrating Light Moisturiser.' There's no tactical reason for this - I think it genuinely was a case of me once picking up the wrong one, not realising and ever since repeating the same error. They're both great moisturisers and are again really reasonably priced at under a fiver. The light moisturiser tends to get better reviews both from customers and press pieces - because sometimes rich moisturisers can be too rich. I don't have a favourite as such - when my skin's a bit drier than usual I'll go with the rich one and when it doesn't need as much moisture I'll go with the light one - simple as that. The light moisturiser I would say is better for day to day use as I find it sits better under my make-up but I don't always wear it under my make-up, as I'm worried that my foundation will slide off. Maybe I need to spend more than 10 minutes on my routine every morning but when it's a choice between bed or beauty, the bed will always win. I've included this product in my everyday routine even though I don't technically turn to it everyday but it is one of my skincare essentials so I thought I'd throw it in for good measure. I realistically use it between one and two times a week. Usually before a night out, after a long day at work or when my skin just needs a treat. It's the most expensive 'frequent' product I use but compared to some other brands it's not expensive at all and as it works really well for me I can definitely justify the price. So as the name suggests you can use it as a cleanser, scrub or a mask. I pretty much only ever use it as a mask and leave it on way past the allocated time. I'm not condoning you do the same - always go with the recommended time but for me nothing bad happens so I just go with it. I smother it all over my face and let it work its magic. You can feel your face instantly tighten as with any mask but as soon as it's off my skin feels so smooth and so soft, as well as really clean. I did write a full dedicated review of this product here if I've missed anything off. So that's pretty much it. I leave myself 10 minutes everyday to do my routine and apply my make-up. This is usually for week days only because I commute to work so every second in bed is precious. During the weekend I can indulge and apply my make-up at a more glacial pace. I love reading these and being nosy so feel free to link yours below or recommend me any products I need to try.